Lobster. 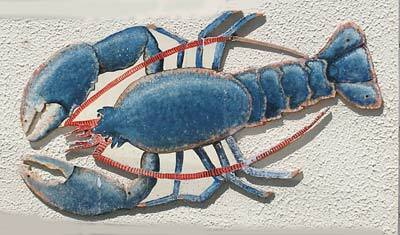 The European lobster is a large, marine shellfish with huge claws and is dark, mottled blue-black before cooking, turning red during the process. The flesh is sweet and tender. The Maine or American lobster found in the United States is huge in size and lacks the wonderful sweetness of its European cousin. American varieties may sometimes be brick red before cooking. In Europe they are likely to up to 2 kg (4¼ lbs) while North American ones may be a lot larger. Increasingly, American lobsters are imported for use in Europe. There is great debate about the most merciful way to despatch lobsters, which are usually bought live. Some suggest placing them in the freezer for half an hour so that they lose consciousness before being submerged in boiling water. Others say that inserting a sharp knife strongly into the back of the head, through the brain, and then cutting down through the length of the body is the best way. One method, which does not seem to me to be ideal, is recommended by the RSPCA and involves placing them in cold water which is then gradually brought to the boil.